GREENSBORO, N.C. — Our spring break has been just that, a break. Now, it's back to winter. You'll need to buckle up for this adjustment, as temperatures could drop 40-50 degrees from Thursday afternoon to Saturday morning. Here's what the WFMY News 2 Weather Team is tracking. We've been way warmer than normal, setting a record high on Tuesday and coming close on Wednesday. Another record high will fall on Thursday. All of this is happening thanks to a summer-like weather setup, with high pressure off the coast, pumping in heat from the south day by day. This setup can't last that long in February. A strong cold front heads our way on Friday. 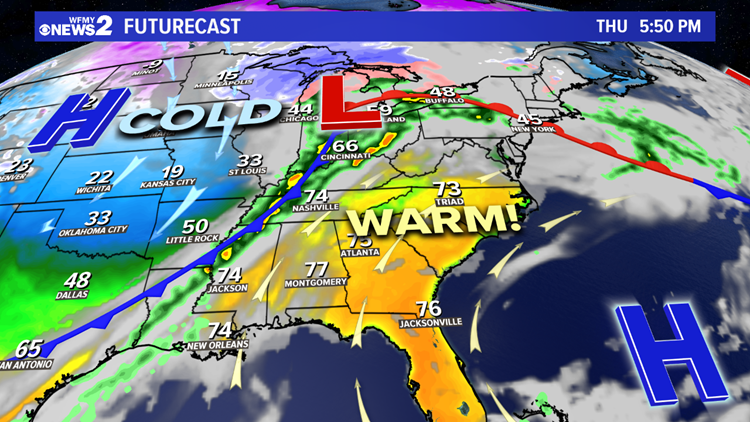 To the west, there's a strong cold front moving our way. This front will be moving through on Friday, which will give us a backwards temperature day. We'll start the day in the 60s, with temperatures falling into the 40s by evening, and the upper 20s overnight into Saturday morning. This front won't come with much rain, with only a stray shower possible and no threat of storms. The weekend will be much more winter-like for us. Highs in the 40s with lows just below freezing each day. Saturday will be dry with a lot of sunshine. Sunday will be partly to mostly cloudy, with a chance of some showers late evening. Next week, a wet and chilly pattern will return.